Product Review: Oluji Pure Cocoa powder. Yaay!! I have finally (after procrastinating for so long) decided to start doing reviews of some weight loss and wellness products that i have used. These reviews could help you make your decision on whether to use them or not. 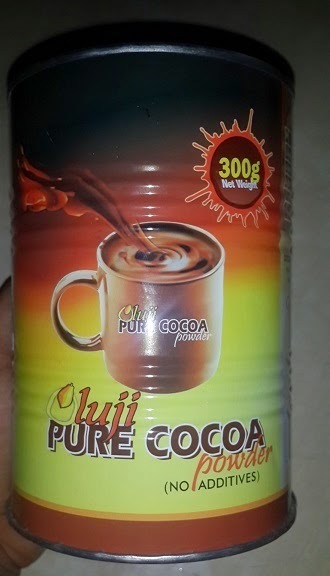 Today, its 'Oluji pure cocoa powder' I have been using this product since early last year when i started my journey. I was very skeptical about it, you know how we feel about some Naija made things na, but i still tried it anyways. I have been hooked ever since! The price: I buy mine for N600 which is awesome, compared to some foreign products and its shelf life. It lasts long: I use a can of 300g, for about 2 months before it finishes. I use about a tsp at a time. Its rich in nutrition: High in Protein content, high in fibre and carbs too. Its low in calorie. It comes to about 12 calories per table spoon. This is great news if you ask me. Contains no additives, its PURE cocoa!! Kids can eat it too. I lace my kids' pap and tea with it a times, then i add honey, they cant tell the difference. Hehehehe! I use a teas spoon of it daily in my coffee. I use it in baking. I use it in my face mask. It has a slightly bitter taste, I like to think its an acquired taste. You should get used to it with time. Cheliz' rating: 5 Thumbs up!!! Many stores, pharmacies and supermarkets carry this item, so it shouldn't be hard to find. I have been using this product for over a year now, and i can firmly say that it is GREAT! Quickly add this to your shopping list for the weekend. Lol. Who has used this product? Do you love it as much as i do? God bless. Lol! I like your dad o jare. He sabi better thing. Yes i use it to bake red velvet cup cakes. Depending on how rich you want the chocolate taste to be, u can use half cup to every 2cups of flour, start small if you dont like the rich taste. Kill the bitter taste with some honey. Yes its also used in baking chocolate cakes. Hope u enjoy it. Thanks and Cheers. i bought mine since two months now and have not used it. i read about it on the net and found it very beneficial. thanks cheliz for more info on this, will start using mine. Hmmm Sweetpie, what were you waiting for? Lol. Thanks Cheliz, this is a great piece. Come to think that this special gift of God has been with us for decades without our coming to realizing its tremendous health benefits! Better late than never? I am sure your blog will help thousands to grab this cheap way to healthy living. 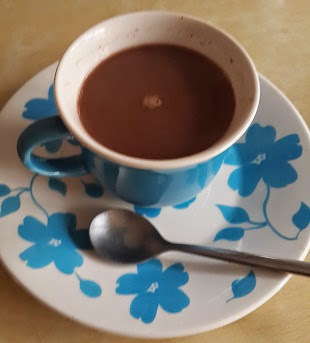 A cup of Oluji Pure Cocoa Powder a day may be all you need to take medical bills off your expenses checklist. One major advice though: try this powder on its own for enhanced benefits. So true Sir, we have all we need to live a healthy life right under our noses. Lol. Come to thing of it, i have never tried having the powder alone. Hmmm, will try that asap! Thanks so much for commenting. God bless. Hmm Ruby dear, I was using this product before now, itz very good though I have asked them if preggy woman can use it and they said yes but men am not convinced so I will have to wait. Ngwa chop some Love from mua! My dear, i think its safe. Its very nourishing and no side effects. Yummy too. Dont deprive that baby o, i go vex for you o. I missed u o Stella. Abeg dash baby small kiss from me. Take care. Thanks , you too luv. Hi. Pls where can I get this product? I heard of it from my aunt and i've been looking for it all this while! Hi Eny, check shoprite, spar, goodies, or any other supermarket. It pretty much everywhere in Lagos. Where do u stay? Thanks. I stay in Lagos, Surulere to be precise. I've checked before. Guess i'll just check again. Ok, please check. Even small stores carry it.